Most of us woke up from Tongariro quite excited to leave. The backpacker’s lodge was by far the best place any of us had stayed, but it was time to move on. The night before a bunch of bikers had checked in for the annual Ride to the Summit event, so the place was beginning to feel crowded anyway. At first it was kind of depressing to know we would once again be occupying a huge Stray Bus, but as it was, half the seats were empty. Forty minutes into our drive to Wellington, the bus overheated and we had to pull over for 15 minutes for it to cool down. It was beginning to look like a long journey. We stopped in Taihape where they claim to be the gumboot throwing capital. A gumboot is just a rubber boot. We went to the “arena” as it was called, which was actually just a strip of grass lined by two high chain-link fences. Out of the 14 girls on the bus, I had the farthest throw, and I didn’t even feel that I threw it all too well. I had to have a sudden death throw off with the male winner, Henri, but that worked out as well as expected. For lunch we stopped in Bulls, a quaint little town that had a lot of thrift/antique shops down its main street. The town’s claim to fame lies in the clever signage across the city. The pharmacy, for instance, has the sign “Dispense-a-bull,” the Subway sandwich shop has one that says “Submerge-a-bull,” the bank has “bank-a-bull” and so on. It was cute, but whatever. We continued on our journey until about 15 minutes outside of Wellington when our bus’s air-brake system developed a problem and it would no longer allow the driver to engage the bus. We sat for about 30 minutes this time and waited for another bus to come retrieve us and bring us to our hostel in the city. Becs and I didn’t waste anytime. New Moon had opened two nights prior and we were going to see it one way or another. We got to the cinema at 4:57 and we booked the 5 p.m. show in the second row. Ah well. At least we saw it and it was marvelous. Everyone went to sleep early that night. The shuttle to take us to the ferry docks would be picking us up at 7 a.m. That’s the thing with Stray, there are a lot of early mornings and there are a lot of add-ons that are unexpected. The ferry to the South Island was $50. But it was interesting that they checked our luggage in, just like on an airliner, except that when we got off the ferry and into the terminal just outside Picton on the south island, our luggage was already waiting. Getting to the terminal was a little difficult for me. This was the end of my Stray journey. I had to say good-bye to my new Irish friend Andy whom I’d been travelling with since day one on the bus. Henri, Becs, Rene and others who had left the bus earlier, like Gillian, Sophie, Chris, David, Ashley and Keith. It was sad, but I will always remember my Stray Bus experience. Mat picked me up from the terminal with a six-pack of beer in the front seat. He took me to his sister’s place in Blenheim and showed me a nice little apartment in her garage where I would be staying. Of course, a few hours later he would ring me and tell me that his mother thought it was unacceptable to isolate me and that I must stay at her house. No problem. After we dropped off my luggage we decided to go wine t asting. 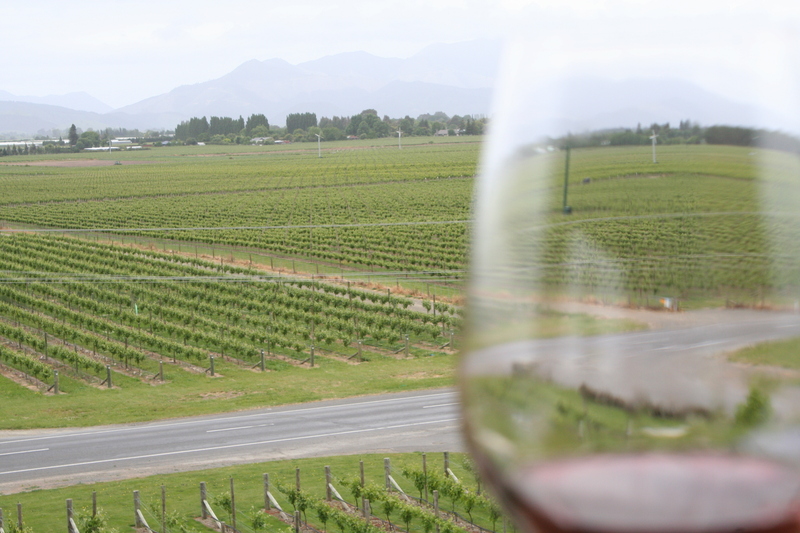 Marlborough Region, on the northern tip of the South Island, is home to more than 100 wineries. The region is sheltered by two ranges of mountains/hills that protect it from the harsh weather that usually pommels such coastal regions. It’s also the sunniest part of the country. And seeing as most of New Zealand is volcanic, the soil is ripe. The Sauvignon Blanc produced in this region is world famous. The Pinot Noir I must say is also quite amazing. Driving around and seeing the vineyards everywhere reminded me a lot of home in Niagara, but there was one very real difference. All of the wine tastings in Marloborough are free. People sometimes go from one winery to another to another all day long getting drunk off free wine tastings. I should note that the drinking and driving limit in New Zealand is 0.08 per cent for drivers over 20 and 0.03 for drivers under 20. That’s about three drinks for a woman, or four drinks for a man. I slept the night away in my private little “motel room” and awoke at 6 a.m. I called Dave in California and after a nice chat with him I fell back asleep. I suppose I felt like all was right with the world, so I sunk into my bed and drifted off into nod, awaking at noon to over cast skies (which I’m getting used to) and a warmer temperature than the day before.